Silvia Huezo, a 24-year-old El Salvador native who grew up in Takoma Park, opened Red Hue Boutique in College Park last year and relocated it to Rockville in February. 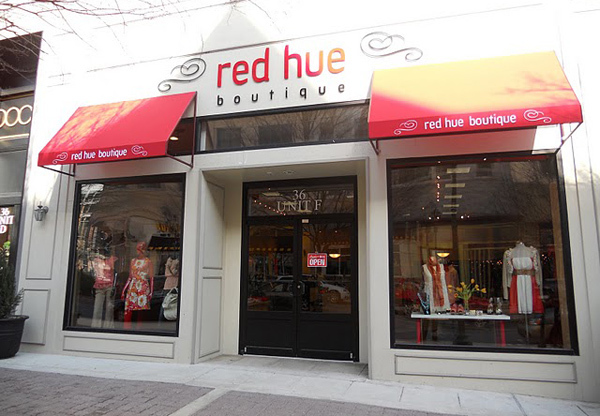 The brightly painted red-and-white store carries Red Hue items, designed by Huezo, and clothing from independent brands such as Dainty June, Ark & Co., and Dolce Vita. Looks are an ode to retro with a fashion-forward twist: The tomato-colored mannequins sport high-waisted skirts, bright ruffled tops, and sailor-style rompers. Funky shoes and accessories, such as egg-yolk-yellow slung bags and loafer flats, could complete your outfit.